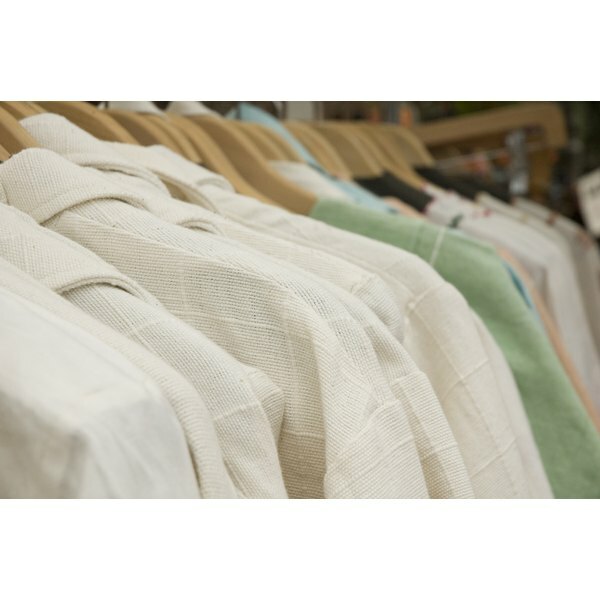 Close-up of linen shirts on hangers. Linen is an all-natural fabric made from flax and tested by time. It's been around since the ancient Egyptians, who used it to wrap mummies. You may think of a linen shirt as a summer-only garment, but you can wear it just about any time of year if you live in a warm climate. A paper-thin linen shirt looks crisp and keeps you cool on a hot day -- but the fabric does have its drawbacks. Linen's light and porous texture allows air to move through the fabric, keeping you cool on the hottest of days. The fabric doesn't feel heavy from perspiration or moisture like cotton does; rather, it can absorb up to 20 percent of its weight in moisture before feeling damp. Linen keeps its shape, even after multiple cleanings, for a put-together look, and it resists pulling, static cling and dirt. The process of making linen is also kind to the environment, as flax crops require few pesticides and take less water to grow than cotton. Linen's biggest drawback is that it wrinkles significantly and deeply. Tucking a linen shirt into your pants magnifies the wrinkling, and folding it can result in wrinkles that remain embedded for a long time. Linen is tough to pack for this reason and may not be the best choice for vacations where you won't have access to an iron. Linen shirts don't mix and match well with separates made of other fabrics. Go for a uniform, sophisticated look by pairing a linen shirt with linen pants, shorts or skirts, and blazers. Hang linen items to avoid fold lines. Stuff the sleeves with tissue paper to help it keep its shape and avoid wrinkling for longterm storage. When you pack a linen shirt in a suitcase, fold it neatly and pack it last. Unpack it as soon as you get to your destination. Hand wash linen or put it in the washer on the gentle cycle. Allow it to air dry, as the dryer can degrade the fabric more quickly. Several manufacturers make shirts out of linen-blends that offer a similar look and cool feel but don't wrinkle as readily. A fabric that's 55 percent linen and 45 percent cotton drapes more readily than linen. Or look for rayon-linen and silk-linen blends. Stretch linen shirts may have a small amount of spandex added to discourage wrinkling. The Wall Street Journal: Is It Too Early in the Spring to Wear Linen?